PHILADELPHIA, PENN. / ORANGE, Calif. (Oct. 13, 2018) - Undefeated featherweight prospect Ruben Villa (13-0, 5 KOs) weighed in at 127.2 lbs. 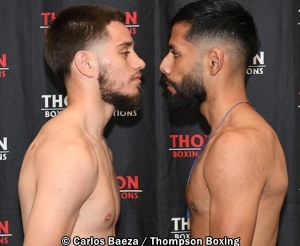 while his opponent Miguel Carrizoza (10-3, 2 KOs) checked in at 127.9 lbs. for tonight's eight-round main event in at the Salinas Storm House in Villa's hometown of Salinas, California. Villa, 21, returns to the Salinas Storm House for the second time this year. Villa vs. Carrizoza is the the 8-round "New Blood" main event. Villa last fought from the Storm House in April, when he routed fellow prospect Marlon Olea in route to winning the vacant WBO Youth featherweight championship. It was Villa's first title since turning professional in July 2016. Tickets for "New Blood" are priced at $40, $75, & $125, and are available for purchase by calling 714-935-0900, or online at ThompsonBoxing.com. "New Blood" is presented by Thompson Boxing Promotions and Banner Promotions and sponsored by Everlast.